In this class we will make wheel-thrown and/or hand-built forms that provide surfaces upon which foods may be displayed and/or served. The “foods” may be “real” or imaginary/ceramic foods that you will make. We will investigate surface processes such as sgrafitto, mishima, resists, etc., and the effects created in the clay by forming processes in wet, leather hard, and bone dry clay. My previous class at Shakerag in 2008 was about how to find and develop ideas and how to bring them to life in one’s work on the potter’s wheel. My hope was that people would find new paths and directions to help them make their work more personal and expressive. I tried to emphasize intensity and perception so that what you see, photograph, draw, or collect can hold ideas that will become more meaningful and gain depth through your penetrating observation. To help make this point, I read from various writings, gave demonstrations, and showed slides illustrating how several artists used these sources to influence their work. Ideas and directions can come from magical and unexpected sources as well as from familiar things that we see every day. The intensity of your perception will help you find your way. Some experience on the wheel is required for this class. Please bring sketch books and drawing tools in addition to your usual clay throwing tools. Note: The Shakerag store carries a wide variety of clay tools and will have available for sale all the tools necessary for Val’s class. Val received his BFA and MFA from the School of Art & Design in the New York State College of Ceramics at Alfred University. 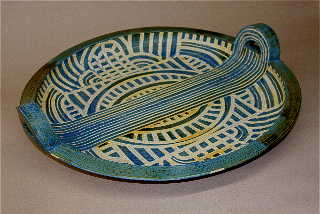 He taught pottery and technical courses concerning clays, glazes and related subjects at Alfred for over forty years. He retired from Alfred in 1997 and was designated “Professor Emeritus”. Val found his profession to be challenging, always stimulating, and one filled with memories of friendships and wonderful students. At various times, Val has taught in England, Norway and Spain. He has given over 250 lectures, workshops, and demonstrations that have taken him all over the United States, to Canada, Ireland, England and Japan. His pottery has received many awards and honors, has been seen in well over 200 exhibitions, and in numerous one-person shows. He is represented in the collections of many public and private museums and galleries in the USA and around the world. Val has received honors from Alfred University, from New York State, and from NCECA for his role as a teacher. He is a Fellow of the American Craft Council and of NCECA (The National Council on Education in the Ceramic Arts) where he was a founding member and a past president. He has received an artist’s grant from the National Endowment of the Arts; a Fulbright grant for teaching and research in Manchester, England; and an artist-in-residence grant at the Archie Bray Foundation and at the University of Wolverhampton, England. My work continues to be influenced by all that is described above. Aspects found in Nature have always been a primary source and influence in my work; architectural columns have also had a strong influence. However, without the almost constant pursuit of the intimate knowledge and practice of the materials and processes so vital to forming, decorating, glazing, and firing, it would not be possible for me to express the insights and ideas that form my vocabulary. Changes evolve naturally in all creative work. Every artist must continue to develop aesthetic points of view, styles of working, sources, new ideas, insights, and approaches to materials and processes which can change one’s work – subtly, or drastically! In my present work, I continue to improvise and expand upon ideas and techniques. Over the past four or five years, I have focused more upon the effects of activations on the surface of my forms, whether in or on the clay or both! I feel very grateful and lucky to be able to continue my work and to keep finding new thoughts and insights that excite me.